NanoSurface Cultureware structures cultured cells and tissues to improve physiological relevance. Shortly after plating, cells cultured in NanoSurface Cultureware exhibit enhanced structural and phenotypic development as compared to cells cultured in conventional culture dishes. NanoSurface topography induces cytoskeletal reorganization and cellular alignment. NanoSurface Cultureware is available in familiar standard formats, featuring No. 1.5 glass-bottom wells for high quality imaging. NanoSurface Cultureware features a nanopatterned culture surface which provides a cellular microenvironment that mimics the aligned architecture of the native extracellular matrix, improving physiological relevance by promoting development. Cells can align, elongate, grow, and even migrate along the pattern while exhibiting more physiologically representative structural and functional phenotypes. Conventional cultureware does not utilize biomimetic surface topography, which results in random structural orientation. The disorganized isotropic cell and tissue architectures result in immature functional phenotypes that do not reproduce in vivo function. These inaccuracies lead to imprecise, hard-to-reproduce results and wasted time and effort. On NanoSurface dishes, cardiomyocytes align to the surface topography, elongate in the direction of the nanopattern, and exhibit uniform anisotropic contraction patterns, with enhanced contractile force and conduction velocity. 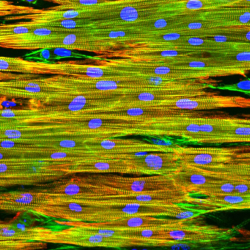 Without biomimetic surface topography, cardiomyocytes exhibit random orientation, disorganized contraction patterns, and immature functional phenotypes on conventional culture surface. 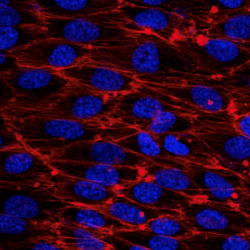 CDI iCell cardiomyocytes on a NanoSurface dish (left) vs. conventional dish (right). Cardiomyocytes elongate in the direction of the nanopattern, develop structurally organized cytoskeletal networks, anisotropic cell shapes, striated and physiologically-spaced sarcomeres, and exhibit polarized expression of gap junction proteins. These and other changes lead to cardiac cells with more physiological and mature electrical and mechanical properties such as faster action potential conduction in the direction of the nanopattern, and improved contraction force and velocity. 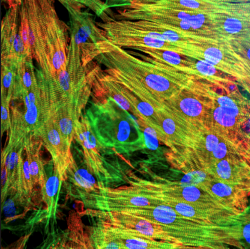 Endothelial cells on a NanoSurface dish (left) vs. conventional dish (right). 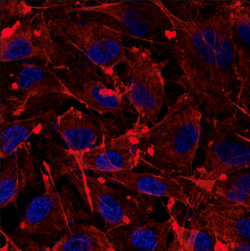 Endothelial cells form aligned layers with physiological anisotropy, and exhibit lower expression of inflammatory cytokines. 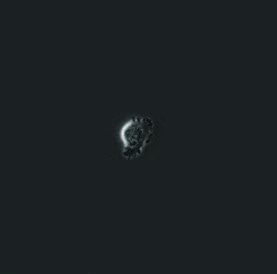 Directed migration of cancer cells on a NanoSurface dish (left) vs. on a conventional dish (right). 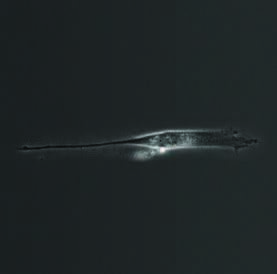 Glioblastoma cells grown on traditional flat cultureware lose their migratory phenotype in culture, while cells grown on patterned dishes maintain it, with migration directed along the length of the pattern. Images from Smith et. al. Cell Reports 15(12):2016. 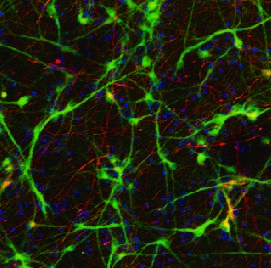 Two-channel confocal image of CDI cortical neurons cultured on NanoSurface Cultureware (left) vs. on a conventional dish (right). 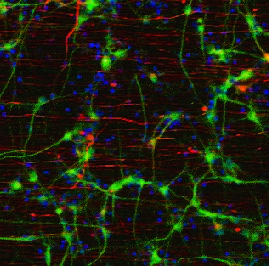 On NanoSurface Cultureware, neurofilaments (red) align along the direction of the nanotopography while dendrites (MAP2 stain; green) do not. *ANSI/SLAS compliant. All numbers approximate and subject to revision. NanoSurface nanopatterned culture surfaces provide a cellular microenvironment that mimics the aligned architecture of the native extracellular matrix, promoting cellular structural and functional development. NanoSurface coverglass features the same polymeric nanoscale topography found in NanoSurface culture dishes and plates. Unpatterned control coverglass is also available: fabricated with same polymer and process as NanoSurface coverglass, without nanoscale topography. 35mm glass-bottom dish with a polymeric nanopatterned surface topography. 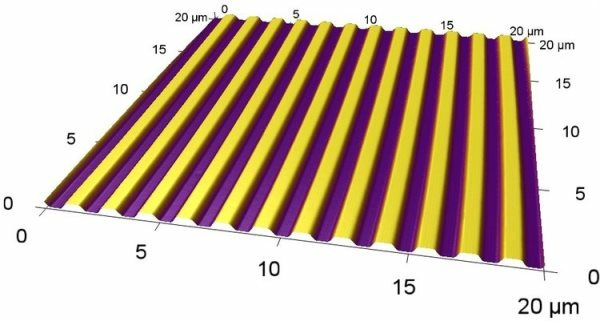 6, 24 or 96-well glass-bottom plates with a polymeric nanopatterned surface topography.